The 2017 recipient of the ’62 Scholarship is Joshua Wright, Berea/Midpark class of 2017. 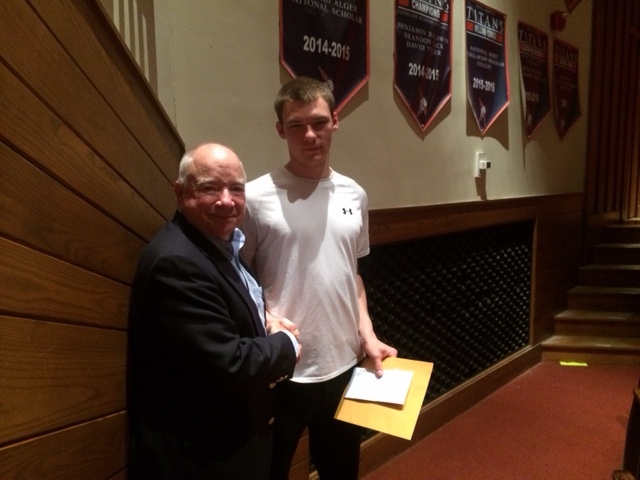 Hi all… Thought you’d like a quick report on the Senior Scholarship Recognition evening at Berea Midpark High School. The recipient of our BHS Class of ’62 scholarship was Joshua Wright, who will be attending Ohio University with studies focused on math and statistics. He’d like to become an actuary. Nice young man… and appreciative of the $500 award. At the microphone I was able to announce that we expect that our Class of ’62 scholarship funds will this year be sufficient to become an ongoing, perpetual scholarship. BHS class of 1976 is the only other class that awards a scholarship. Cons took the attached photo. This entry was posted in '62 Scholarship. Bookmark the permalink.